NMPA President & CEO David Israelite (pictured) has said that digital music companies would ‘declare war on songwriters’ should they appeal a 44% streaming royalty rise decided by the Copyright Royalty Board (CRB) last year. On January 27, 2018 MBW reported on the CRB’s landmark ruling, which stated that royalty rates paid to songwriters in the US from on-demand subscription streaming would rise by 44% over the next five years. The CRB’s decision was the result of a trial that took place between March and June of 2017 with the National Music Publishers Association and the Nashville Songwriters Association (NSAI). Yesterday (February 5), the CRB published the final rates and terms for songwriters – giving streaming companies 30 days to lodge an appeal if they wish. 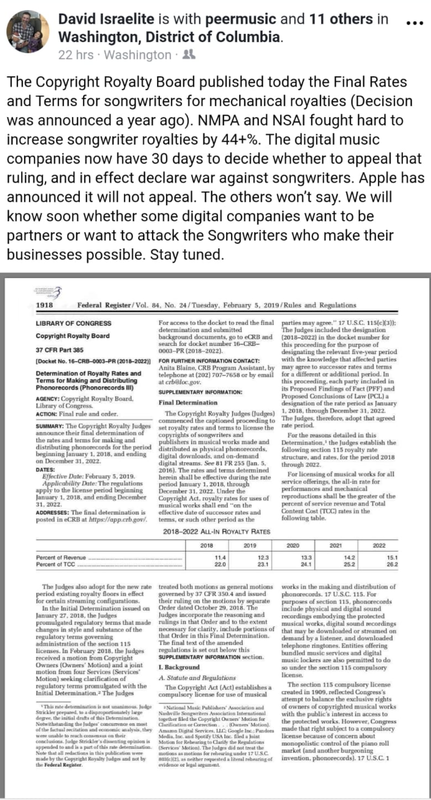 Israelite posted a message on Facebook (see below) stating that the NMPA and the Nashville Songwriters Association International (NSAI) “fought hard to increase songwriter royalties”. He pointed out that Apple has already ruled out an appeal, adding that if any other streaming companies now chose to challenge the terms, they would “in effect, declare war on songwriters”. Speaking in 2018, NSAI Executive Director Bart Herbison said: “Songwriters desperately need and deserve the rate increases resulting from the Copyright Royalty Board (CRB) trial.